Dionysus Records inaugural 78 RPM release does the label proud. 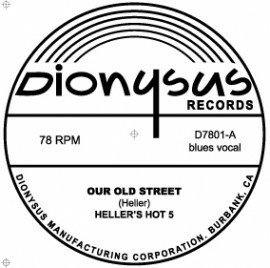 Roots/exotica/rockabilly master Skip Heller returns to the imprint with Heller’s Hot 5, including Dionysus Records head honcho Lee Joseph on acoustic bass, delivering three smoking, blues-drenched tunes, recorded and cut live to mono tape by former Big Sandy and the Fly Rite Trio’s bassman, Wally Hersom, on all tube powered analog gear. This platter that matters is a limited edition vinyl microgroove 78, playable on anything that plays 78, including jukeboxes. The release comes with a download card. Includes digital download with bonus tracks!